Is Ingersoll-Rand Cooling Down or Heating Up? How does this industrials sector value stock present the opportunity to reward committed investors? Ingersoll-Rand (NYSE:IR) is a diverse machinery company producing industrial and commercial products ranging from HVAC units to Club Car golf carts. The company's revenues are generated from residential, commercial, and industrial customers across the globe. Ingersoll-Rand operates in several mature industries with stagnant revenue growth over the last few years. Believe it or not, this creates a great opportunity for the company. It can enhance its focus toward innovation and margin growth to outpace competitors. The company has acknowledged these opportunities and has also came up with some interesting solutions of its own. Last year, the company announced it would be spinning off its security business, which brought in 12% of total revenue. The new company, Allegion, will become a leading provider of security solutions for customers on a global level. This spin-off can allow the company to focus largely on its core businesses of climate solutions (53% of revenue), residential solutions (14%), and industrial solutions (12%). Ingersoll-Rand is using this new structure to develop efficiencies and integrate all aspects of its business. The company can now create an emphasis on growing margins and creating more efficient operations in a mature industry, while the new security business can work on revenue growth and expansion. Dividend yield has increased about 125%, from $0.28 in 2010 to the current $0.84 yield. In December 2012, the company announced a 31% increase in the quarterly dividend. This was one of the benefits to shareholders of the Allegion spin-off. The 1.26% dividend payout ratio of Ingersoll-Rand is behind the 1.68% industry average. However, the company's capital allocation strategy includes a focus on increasing the dividend to match the payout ratio of its peers. The company also announced a $2 billion share repurchase, which is now under way. This is following the $2 billion in repurchases from 2011 to 2012. Since 2009, yearly revenue has been sporadic, but the margins are consistently increasing. The chart below illustrates margins growing at a faster pace than revenue. Revenue has only grown 8.69% from the beginning of 2010, but the gross margin has grown 15.92% and the operating margin is up an astounding 51.86%. These increases in margins are clear-cut evidence the company has worked to find ways to maintain earnings during difficult sales periods. 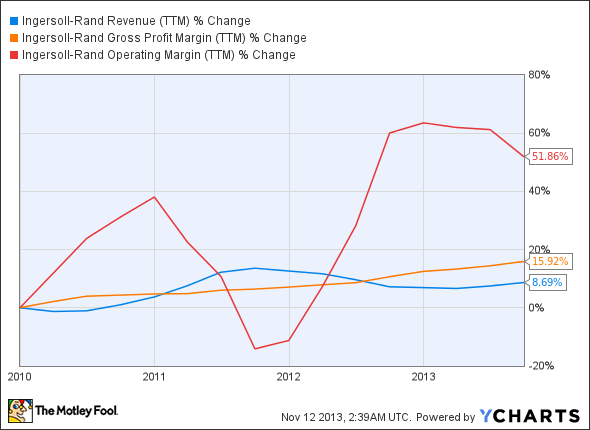 Gross profit margin for Ingersoll-Rand has gone from 26.91 % in 2009 to 30.47% in 2012. Management has acknowledged that the macro environment has not performed ideally in the last several years, but they are pleased with the company's growth in this environment. Margin results are in part due to the expansion in the high margin commercial HVAC and industrial segment. These are mature segments that have experienced over 5% compounded annual growth rates since 2005. Margins have also expanded due to strategies focusing on operational excellence. How does Ingersoll-Rand stack up to its peers? The United Technologies (NYSE:UTX) climate, controls, and security segment competes largely in the commercial HVAC industry. In 2012, the segment produced 30% of the company's total revenues. The chart above compares the gross profit margin growth of these companies with Ingersoll-Rand's over the last five years. Honeywell International (NYSE:HON) is a large competitor of Ingersoll-Rand. Its automation and control solutions segment produces control systems, security and life safety products, and building solutions. These products and services compete directly with the majority of the Ingersoll Rand offerings. The growth in Ingersoll-Rand's margin is noticeably stronger than the other two companies. However, in order to compare the companies on an apples-to-apples basis, we must look at the results from the competing segments. 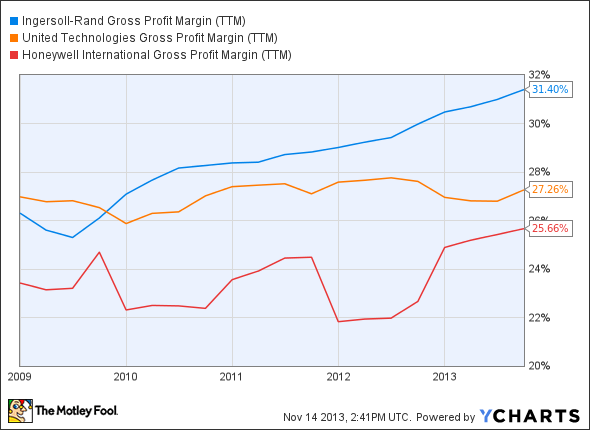 United Technologies' climate, controls, and security segment gross profit margin of 14.2% shows 4.3% growth from 2010. The growth is impressive, especially during the difficult economic environment of the last few years. However, the segment has only increased revenue 1.5% in the previous three years. In comparison, Ingersoll-Rand's revenue grew 8.1% and its gross profit margin grew 4.5% in this same time frame. Honeywell's automation and control solutions segment revenue has grown 15.2%,or 8% excluding acquisition growth, since 2010. However, the margins have only expanded 1.2% in this same time frame. Honeywell has proven that it can grow revenue organically and through strategic acquisitions, but the small gain in margin is not a great sign. There has been a lot of conversation about spending decreases across Europe and the segment produced 35% of its revenue in the Europe-Middle East-Africa region. If revenues are affected by these decreases the lack of margin expansion will hurt the bottom line. The company keeps track of innovation revenues, which includes sales of new products introduced over the last three years. The company has nearly doubled its innovation revenues in this time, which totaled approximately $3.3 billion in 2012. Ingersoll-Rand has also continued its investment in emerging markets. The company recently built two research and development facilities in emerging countries to work to expand on its international product line. Also, 27% of total revenue in 2012 was from emerging markets. One of the strategic goals has been in developing the company into a more sustainable business. Within this goal, the company created an initiative to reduce its manufacturing footprint by 2013. Ingersoll-Rand had 94 manufacturing facilities in 2009; prior to the spin-off of Allegion, it had only 64 facilities on line for 2013. This has allowed the company's operations to streamline efficiency across multiple locations and to produce a lean transformation, which allowed the company to expand lean operation margins by 6.7% since 2011. Ingersoll-Rand may not be the flashiest company, but it is showing clear signs of potential. This company might not bring 300% returns over three years to investors; however, it has a strong core business with a large commitment to improving operations, margins, and innovation. Ingersoll-Rand has also expanded its focus in increasing returns to shareholders. If the rise in dividends and share buybacks continues, then Fools will enjoy steady returns from this solid company. Overall, this stock is a long-term investment that would be a great add to any Foolish portfolio. Matt Pelletier is a recent graduate who has always had an interest in the market. Since starting life in the real world, Matt has expanded his investing and loves a good value stock. He enjoys investing in Industrial and Technology stocks and he considers a 10-K as light reading. All opinions and analysis are his own.